Thurstan College and Isipathana College will lock horns in their 53rd edition of the "Battle of the Brothers" big match encounter played for the Blackham Wijewardena memorial trophy will take place at the SSC grounds today and tomorrow. Both schools have shown a tremendous amount of success in the last few matches and a close game is expected. 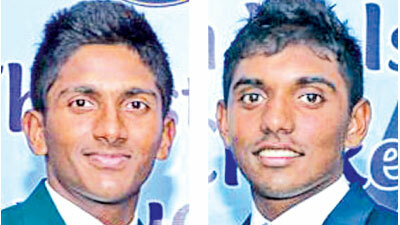 The two schools have a number of talented cricketers who should feature in future Sri Lankan teams. Thurstan with a cricketing history of over 50 years has already produced a Test cricketer in Niroshan Bandaratilleke in addition to national players Amitha de Costa and Hemantha Boteju. Thurstan has produced several fine club cricketers in Vernon Caldera, Diyanesh Rajaratnam, Jayalath Aponso, Upali Bandaratilleke, Saliya Wijewardene, Mahesh Jayasekara, Tissa Salgado, Sathya Jayasuriya, Shehan Kamileen and Deepal Madurapperuma. In recent years Thurstanites have produced a fine cricketer in Umesh Karunaratne who had the distinction of being adjudged "Observer- Mobitel" Schoolboy Cricketer of the Year in 2008, while two years later Shehan Kamileen had a fine season scoring over 1000 runs. Among the Isipathanians are Jayantha Paranathala, Uvais Karnain and Test players Asoka de Silva who had the honour of serving in the elite ICC umpires panel after his retirement. Nuwan Soyza who took a hat-trick against Zimbabwe in a Test match in Zimbabwe in 1999, Suresh Perera and the youngest Test player produced by Sri Lanka Sanjeewa Weerasinghe who played for the country at the age of 17 years and was a few months younger than the other 17-year-old Roshan Jurangpathy of Royal, both of whom played against India in the 1985 Test series in Sri Lanka. The lads from Havelock Town have also produced several players who have excelled in club cricket like Mervyn Peiris, A.U. Seneviratne, K.L.S.K. Sirisena, K.H. Nandasena, Lanka Perera, Harsha Deepal, and K.G. Priyantha. In recent years Isipatana produced a superb bowler in Anushka Samaratunga who broke Nimesh Perera's school's bowling record by capturing over 140 wickets. The Thurstan-Isipathana annual Big Match began in year 1964 and of the 52 matches played so far Thurstan is leading the tally with five wins against Isipathana's four. The rest of the matches have ended in draws. In 1971, the Big match was not played due to the April insurrection. The last win was recorded by Isipathana was in 1999 under the captaincy Thushantha Jayawardene. Thurstan's last win was in 1992 under Mackenzie Perera. For the past 17 years the matches have all ended in draws and with both team equally strong a winning result seems very unlikely. Pathanian Saman Nishantha's unbeaten 150 in 2002 is the highest individual score while Sri Lanka Test player Nuwan Zoysa's 10 wicket-haul (5-41 and 5-51) in 1996 are the best in bowling. Kamal Mahendra 142 remains the top scorer for Thurstan in the series. Thurstan's left arm medium pacer Jayajeeva Karunaratne (7 for 28) has the best bowling analysis in the series with Ispathana's K.L.S.K .Sirisena also taking 7 for 49 in the 1967 match. This year, the Thurstanites are led by fourth year coloursman Charana Nanayakkara who will be assisted by another fourth year coloursman Sajith Gunatilleke. The Isipathanians will be anchored by fifth year coloursman Salinda Ushan. He will be well supported by third year coloursman Pramod Maduwantha. Thurstan have played 15 matches winning five outright and five on first innings this season. They qualified for the pre-quarterfinal as champions of Group 'B' but lost to St. Servatius Matara. Five Thurstanites Sajith Gunathilake, Salinda Samaranayake, Charana Nanayakkara, Kasun Abeyratne and Isitha Wijesundara) have scored over 300 runs for the season with Nanayakkara, Nipun Lakshan and Isitha Wijesundara making centuries. Two of their bowlers Dilan Madhushanka and Naveen Gunawardana have obtained over 35 wickets. Isipathana has recorded three outright wins and 13 on first innings this season in 18 matches. Isipathana qualified for the pre-quarterfinals as champion of Group 'C'. They beat Nalanda and advanced to the quarterfinals. Isipathana have eight batsmen Sanjula Abeywickreme, Pramod Madhuwantha, Ayana Siriwardene, Heshan Dhanushka, Kalana Perera, Pethum Nissanka, Salinda Ushan and Vishard Randika who have scored over 300 runs. Abeywickreme passed 1250 runs for the season with a double century and 4 centuries. Madhuwantha has made 3 centuries and also captured 70 wickets. Lahiru Dilshan 70 wickets and Iwanka Sanjula 65 wickets are the key bowlers in the side. Two Pathanians Salinda Ushan (skipper) and Vishad Randika (wicket-keeper) and one Thurstanite Charana Nanayakkara (skipper) had the honour of representing the Sri Lanka Under-19 team in the recent ICC Under 19 World Cup in Bangladesh. Thurstan (from): Charana Nanayakkara (Captain), Sajith Gunathilake (vice captain), Ayesh Weeraratne, Kasun Abeyratne, Nipun Lakshan, Salinda Samaranayake, Prageesha Mendis, Thisera Deshan, Imesh Viranga, Yeshan Wickramarachchi, Isitha Jayasundera, Dilan Madhushanka, Naveen Gunawardene, Navod Samarakoon, Thusal Madhushanka, Pansilu Deshan. Isipathana (from): Salinda Ushan (Captain), Sanjula Abeywickreme, Pramod Madhuwantha (vice captain), Vishad Randika, Pethum Nissanka, Madhushika Sandaruwan, Harsha Ratnayake, Heshan Dhanushka, Neranjan Wanniarachchi, Lahiru Dilshan, Ayana Siriwardene, Sanjula Bandara, Kaliq Amath, Kalana Perera, Iwanka Sanjula, Dilsara Saminda.